Discover how Tuya Pearl's inspirational book can improve your life. A therapist with twenty years of clinical experience, she pours her wisdom onto every page for readers to see what takes place within and beyond the walls of therapy. She uses stories, including her own, to teach and encourage readers how to make changes and enrich their lives. Based in Southern California, Tuya Pearl is a wife, mother, and psychotherapist with more than 20 years of clinical experience. She treats individuals, and facilitates groups and retreats that focus on creative expression. She is skilled at helping people discover what lies at the root of their emotional issues so they can find relief and regain a sense of wellbeing. Tuya has had to overcome her own challenges, has a heart for fellow-strugglers, and a desire to unlock their stories with compassionate understanding. 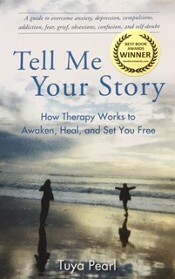 Her book about therapy is a culmination of what she has learned on her journey through the years. As an experienced therapist, she uses her background and expertise to show others that they, too, can overcome adversity, enrich their lives, and embrace their whole story. Thank you for your interest. Please reach out with questions or comments. Tuya looks forward to hearing from you! Please share your thoughts about the book here or leave a review on Amazon. Thank you!